I found it most curious that the audience on Thursday night’s performance of Chekhov’s “The Three Sisters” by The Seagull Project at ACT did not give a standing ovation to the cast and crew. Typically, local audiences are so quick to jump to their feet and applaud practically anything and everything that is trotted out on stage in front of them, no matter its quality or merits. But for some reason, this did not happen on Thursday night, and I was quite honestly taken aback because, for me, this was one of those rare productions that truly deserved such accolades. Perhaps it is the weightiness of Chekhov’s work that dissuaded them. I suppose the canonical Russian playwright can be difficult to digest and appreciate for contemporary audiences who are more accustomed to a modern theatrical style that derives its aesthetics from the likes of Disney films and Hollywood blockbusters, where hyperbolic spectacle and flashy stagecraft trump complex character development, subtlety, and profound ideas. In short, in a world ruled by 15-second sound bites, 140 letter character limited Tweets, instant text messages, and cute kitten Youtube videos, what chance does a play that was written over a hundred years ago in another language and another culture, and during which nothing really happens but a lot of philosophizing and lamenting, really have in competing for the micro-sized attention spans of today’s highly distracted public? In this production, the focus remains, as it should, on the characters, on their relationships with each other and the world in which they live; it focuses on the ideas, the passions, the struggles and disappointments of life; it focuses on the mystery and the misery of existence, highlighting the fragility and precarious nature of the human condition. Under the superb direction of John Langs, “The Three Sisters,” which is the second installment of the company’s projected plans to produce all four of Chekhov’s major theatrical works, is a rock-solid ensemble production with a fantastic cast and technical design team. Langs keeps the (non)action moving at a good pace as he draws upon both traditional and contemporary directorial techniques. I appreciated particularly the way he handled the transitions between the acts. At the end of Act One, for example, Langs communicated the passage of time and the ensuing events that took place in the 21 months that separate it from Act 2 quite adeptly. A reconfiguration of set-pieces carried out by the actors and an ostensible slip of a ring onto a finger by Natalya (played by Hannah Victoria Franklin) communicated with efficiency and ease the changes that had taken place. I also appreciated how the director dared to break the 4th wall at times, allowing the characters to speak directly to the audience on certain occasions. The scene at the end of play, when Andrey, (played by John Abramson), the brother of the three sisters, stepped off of the stage and into the house in order to question the audience directly about the absurdity of life, was a particularly poignant moment. Langs experiments with a variety of techniques, both new and old, both Russian and American, to retell the “story” of the three sisters. I put quotations marks around the word “story” because, in actuality, the play does not really tell a story in the traditional sense. It is more like a precursor to the Theatre of the Absurd, fifty years before it came into vogue. Like the so-called Absurdists, nothing really happens in Chekhov’s play: people talk, they eat, they drink, they argue, they gamble, they play with cards and toy spin tops, and most importantly, they wait; they wait for something to happen, they hope for something more, wishing something would come, but it never does. And perhaps it was this static nature of everything that confounded the audience and impeded them from giving the standing ovation that was deserved. Brilliant performances were given by practically the entire cast. 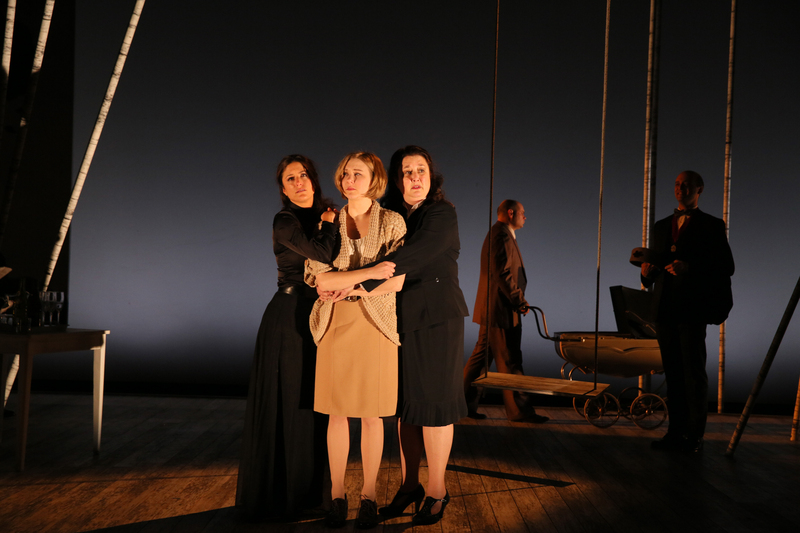 Julie Briskman as Olga, Alexandra Tavares as Masha, and Sydney Andrews as Irina, were very well cast in their respective roles as the sisters. Other standouts among the cast included: Brandon J. Simmons as Kulygin, CT Doescher as Tusenbach, and Hannah Victoria Franklin as Natalya. I was somewhat less impressed, however, by David Quicksall’s performance as the highly philosophical, love-stricken lieutenant-colonel, Vershinin. His pacing was way too fast, and the words came flying out of his mouth without much expressivity or intonation. At times this worked to his advantage, especially near the end of the play when he is, once again, getting ready to go on one of his long, philosophical tirades, but gets interrupted before getting started by the entrance of his love-interest, Masha, – much to Olga’s relief. But overall, the rapidity of his lines often made it feel like he didn’t really understand what he was saying. Perhaps this was a directorial choice, given the verbose nature of the character, but the quick delivery just didn’t work for me. But to be clear, he did have some good moments in the show. “The Three Sisters” plays through February 8th at ACT, 700 Union St. For tickets and info, visit www. ActTheatre.org or call 206-292-7676.